THE ENEMY IS COMING! 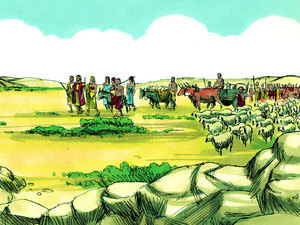 A Bible story about Abraham. Riiiinnnnnnnnggggggg!!! The school bell somehow sounded louder than it ever was before. John quickly stuffed his notebook, papers, pencils and other belongings into his backpack. It had been his first day back to school, but he was eager to get home now so he could go out and play. As he went out the door and onto the sidewalk, he couldn't help but notice that same boy who had been bullying him at recess. "Oh, no! Maybe I should go back inside." But just as John turned around to go back inside, the heavy door slammed shut, locking him out. Too late! The bully saw him coming and was headed straight towards him, with three of his friends right behind. "Hey, John!" he yelled. "Wanna fight?" John tried to act as if he didn't hear him and started walking on down the sidewalk. "Too chicken, AREN'T you?" the bully scoffed. Just then, Mrs. Shade, the art teacher stepped outside with an armload of books. "You boys run on home," she scolded. John breathed a sign of relief, as he watched the bully back away with his three friends. After his father died, leaving him everything he owned, Lot left home and followed Uncle Abram, his father's brother. Because they each owned too many things, they kept getting in each other's way. Before long, in order to keep peace between them, Abram and Lot had to move away from one another. Lot chose to move near Sodom, simply because the place LOOKED so BEAUTIFUL. Yet he KNEW Sodom was a very WICKED city. Of course, he didn't move right inside the city...at first. He just lived near the EDGE of it, not intending to stay very long. Little did he know what was about to happen to him, along with everyone ELSE who lived in that evil city. Living so near Sodom, Lot no doubt often went into the city to sell some of the many things he owned so he could buy food. Perhaps he even sold food he raised in his own garden. Well, each time he went to the market, he learned more and more about Sodom. He found out Sodom's king wasn't really the ruler, for Sodom had been taken over by a king whose name was Chedorlaomer (ked-or-lay-oh' mer). "Where is this other king?" Lot asked one day in the marketplace. "I've never seen him." "Oh," the merchant replied. "That's because he doesn't LIVE here. You see, he's king over four OTHER cities. He's ruled over us for 12 years now, and we're sick and TIRED of it. One day, we're going to show him who's BOSS!" So the people in all five cities banded together and made it known that Chedorlaomer was NO LONGER THEIR KING. Soon the news reached the king's ears. A messenger told the king what the people had done. "Well," said King Chedorlaomer. "If they think they can get by with THIS, they have another thing coming to them." "Send a messenger to my friends, Amraphel king of Shinar, Arioch king of Ellasar, and Tidal king of Goiim. We will show these people who's boss!" And so it was that, in the fourteenth year of his rule, Chedorlaomer and his friends gathered all their armies together and headed toward the Salt Sea, conquering village after village as they went. The news soon reached Sodom that King Chedorlaomer, his friends, and ALL THEIR ARMIES were coming. It struck FEAR in the hearts of all the people. They wondered why in the world they had chosen to live so close to Sodom in the first place. But it was TOO LATE! The enemy armies were ON THEIR WAY. It seemed the entire city of Sodom was in an uproar. People were DASHING back and forth in ALL directions. Mothers were busy buying all the food they could afford for their families, so they wouldn't have to worry about running out of food. Fathers were RACING to get their swords sharpened, and to buy more weapons and armor to defend themselves, and then RACING back home to say good-bye to their wives and children. Children were running through the streets crying, trying to find their moms and dads. Oh, there was so much FEAR and CONFUSION. It was just TERRIBLE! The men of Sodom called for the men of the other four cities to come and help. Together, they met King Chedorlaomer and his friends and their armies on the same battlefield where Chedorlaomer had defeated them 14 years earlier. How close did Lot move to Sodom? Did he plan on staying in Sodom a long time? How long did King Chedorlaomer rule over Sodom? How many other cities did he rule over? What caused the entire city of Sodom to be in an uproar? When the people were afraid, what did they do? Did they turn to God for help? Who is bigger than any problem you have? God is bigger than any problem I have. "Fear thou not; for I am with thee..." (Isaiah 41:10a). bigger than any problem I have. Copyright © 2017 by Barbara Wilmerton Haas.